— The World as Will and Representation, Vol. I, Appendix: "Criticism of the Kantian Philosophy"
In Kant's Transcendental Idealism, Henry A. Allison proposes a reading that opposes Strawson's interpretation. Allison argues that Strawson and others misrepresent Kant by emphasising what has become known as the two-worlds reading (a view developed by Paul Guyer). This — according to Allison, false — reading of Kant's phenomena/noumena distinction suggests that phenomena and noumena are ontologically distinct from each other. It concludes on that basis that we somehow fall short of knowing the noumena due to the nature of the very means by which we comprehend them. On such a reading, Kant would himself commit the very fallacies he attributes to the transcendental realists. On Allison's reading, Kant's view is better characterized as a two-aspect theory, where noumena and phenomena refer to complementary ways of considering an object. 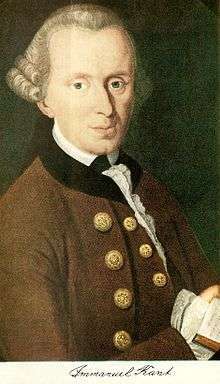 It is the dialectic character of knowing, rather than epistemological insufficiency, that Kant wanted most to assert. ↑ Gottfried Martin, Kant's Metaphysics and Theory of Science(Manchester, Eng. : Manchester University Press, 1955), pg. 57. ↑ Gottfried Martin, Kant's Metaphysics and Theory of Science (Manchester, Eng. : Manchester University Press, 1955), pg. 41. ↑ Immanuel Kant, Critique of Pure Reason, trans. Norman Kemp Smith (London: Macmillan and co., limited, 1933), A 369. ↑ Allison, H. A., Kant's Transcendental Idealism (New Haven: Yale University Press, 1983); Revised and Enlarged Edition, 2004.